This one is going to be a little different. I recently read a book called "Consolations of Philosophy" by Alain de Botton. I found it really interesting and it really made me think. I certainly think more than I should. I remember being told by Miss Kaitlyn Poisson to "Feel more, think less". I don't think I've been following her advice. I re-read it and decided to write down the parts I enjoyed the most and give my much valued opinion on it. Here we go. Blue writing is from Alain de Botton, orange is from me. I couldn't agree more that friendship is essential in being happy. I believe our lives should be shared and filled with people we love. People over places. It doesn't matter where you go in life, it matters who you have beside you. You could be at the most stunning place in the world but could still feel lonely and want to share that experience with someone. You can also be at the worst dive bar in the world with two of your friends and have the time of your life. People matter but I do disagree that you should be careful who you eat with. I'd much rather eat alone and not have to make small chat. We are there to eat not have a debate about importing or exporting. Epicurus and his friends accepted a simpler way of life in exchange for independence. They bought a garden and grew vegetables. Simplicity did not affect the friends’ sense of status because, by distancing themselves from the values of Athens, they had ceased to judge themselves on a material basis. Wealth is of course unlikely ever to make anyone miserable. But the crux of Epicurus's argument is that if we have money without friends, freedom and an analysed life, we will never be truly happy. And if we have them, but are missing the fortune, we will never be unhappy. Why, then, if expensive things cannot bring us remarkable joy, are we so powerfully drawn to them? Because of an error similar to that of the migraine sufferer who drills a hole in the side of his skull: because expensive objects can feel like plausible solutions to needs we don't understand. Objects mimic in a material dimension what we require in a psychological one. We need to rearrange our minds but are lured towards new shelves. For Epicurus, most businesses stimulate unnecessary desires in people who fail to understand their true needs, levels of consumption would be destroyed by greater self-awareness and appreciation of simplicity. Isn't this a reason people go shopping when they are mad or lonely? Buying things is fun, I will admit that but it doesn't last and should't be a way to cope with stress. Even if you desire an object and save for it, once you own it there will undoubtedly be another thing that you want that we think will make us happy. Living in Thailand has definitely simplified my life. "Anger results not from an uncontrollable eruption of the passions, but from a basic error of reasoning." In the Senecan view what makes us angry are dangerously optimistic notions about what the world and other people are like. How often do we need to go over this whole expectations issue? If we don't have expectations, we won't be disappointed when the cookies are burnt, the hotel wasn't clean enough or your flight got delayed. No expectations. How badly we react to frustration is critically determined by what we think of as normal. Our frustrations are tempered by what we understand we can expect from the world, by our experience of what it is normal to hope for. "We aren't overwhelmed by anger whenever we are denied an object we desire, only when we believe ourselves entitled to obtain it." This might have been my favorite quote in the book. I find it fascinating that people who lived in a completely different era than us can still resonate in the present. 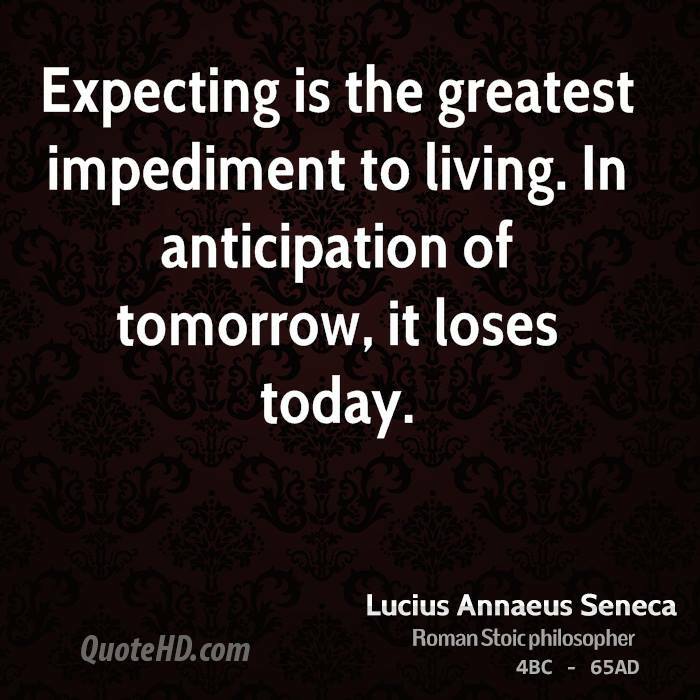 Seneca didn't know anything about Google, spring break or all you can eat buffets but he can still have an impact on the way we act and think. Amazing really. We will cease to be so angry once we cease to be so hopeful. This might sound a bit pessimistic but I definitely agree. We get angry because we expect a certain result or behavior. If we hope for less, it would stand to reason that we might not get so angry. I don't think I get angry very often, I probably did more when I was a kid but now it doesn't seem worth it to get worked up about things. On another note, I taught my class that if you combine angry and hungry which usually happens when you are angry and hungry, we call that being hangry. They loved it. Because we are injured most by what we do not expect, and because we must expect everything, we must hold the possibility of disaster in mind at all times. 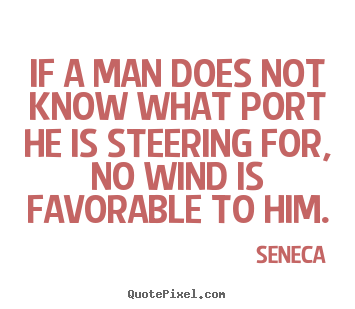 No one should undertake a journey by car, or walk down the stairs, or say goodbye to a friend, without an awareness, which Seneca would have wished to be neither gruesome nor unnecessarily dramatic, of fatal possibilities. I try to keep this in mind at times. This could all be over very quickly. We must embrace life and love. We don't know how long we have here so let's try and make it count. You say: 'I did not think it would happen.' Do you think there is anything that will not happen, when you know that it is possible to happen, when you see that it has already happened...? Isn't thinking fun? Just sit around and ponder all day. How great. A condition of agitation about an uncertain situation which one both wishes will turn out for the best and fears may turn out for the worst. Typically leaves sufferers, unable to derive enjoyment from supposedly pleasurable activities, cultural, sexual or social. Reassurance can be the cruelest antidote to anxiety. Our rosy predictions both leave the anxious unprepared for the worst, and unwittingly imply that it would be disastrous if the worst came to pass. Seneca more wisely asks us to consider that bad things probably will occur, but adds that they are unlikely ever to be as bad as we fear. If you wish to put off all worry, assume that what you fear may happen is certainly going to happen. What great advice. It works. I think we worry way too much about events that will probably never happen and even if they did, we don't know for sure how that new situation would make us feel. I think of a wife who might want to leave her husband but is afraid of starting over and being alone. One day, she finally has the courage to leave, is no longer around a deadbeat and suddenly feels way better because being alone isn't the worst thing in the world and you can now do whatever you want. I think tons of people would be happier if they just embraced change and did what they thought was right in their heart. Deep down we know what is best for us, we just don't always listen. Schopenhauer gave a name to a force within us which he felt invariably had precedence over reason, a force powerful enough to distort all of reason's plans and judgements, and which he termed the will-to-life defined as an inherent drive within human beings to stay alive and reproduce. It was the will-to-life that drove people to lose their reason over comely passengers encountered across the aisles of long-distance trains. The importance of the matter is perfectly in keeping with the earnestness and ardor of the effort. The ultimate aim of all love-affairs...is actually more important than all other aims in man's life; and therefor it is quite worthy of the profound seriousness with which everyone pursues it. I'm just going to go ahead and agree with the last part. I'm not convinced about this will-to-life thing just yet. We are, suggested Schopenhauer, split into conscious and unconscious selves, the unconscious governed by the will-to-life, the conscious subservient to it and unable to learn of all its plans. An exclusion which explains how we may consciously feel nothing more than an intense desire to see someone again, while unconsciously being driven by a force aiming at the reproduction of the next generation. "The moment when two people begin to love each other is actually to be regarded as the very first formation of a new individual." The will-to-life is seeking evidence of healthy children. The will-to-life must ensure that the next generation will be psychologically and physiologically fit enough to survive in a hazardous world, and so it seeks that children be well-proportioned in limb and stable of mind. 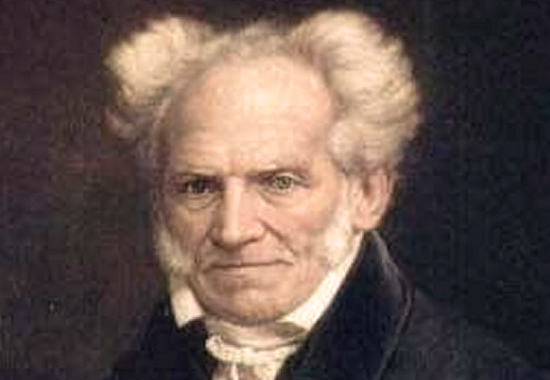 The theory of neutralization gave Schopenhauer confidence in predicting pathways of attraction. Short women will fall in love with tall men, but rarely tall men. Feminine men who don't like sport will often be drawn to boyish women who have short hair. I'd say being tall helps. Having really great eye-lashes and a dashing sense of style and humor also helps. A person who is highly suitable for our child is almost never though we cannot realize it at the time because we have been blindfolded by the will-to-life very suitable for us. "That convenience and passionate love should go hand in hand is the rarest stroke of good fortune." The lover who saves our child from having an enormous chin or an effeminate temperament is seldom the person who will make us happy over a lifetime. The pursuit of personal happiness and the production of healthy children are two radically contrasting projects, which love maliciously confuses us into thinking of as one for a requisite number of years. I strongly hope that this isn't true. This man also didn't do very well with the ladies so I'm not sure I trust him on this subject. He had consolation for rejection-the consolation of knowing that our pain is normal. We should not feel confused by the enormity of the upset that can ensue from only a few days of hope. It would be unreasonable if a force powerful enough to push us towards child-rearing could-if it failed in its aim-vanish without devastation. Love could not induce us to take on the burden of propagating the species without promising us the greatest happiness we could imagine. To be shocked at how deeply rejection hurts is to ignore what acceptance involves. We must never allow our suffering to be compounded by suggestions that there is something odd in suffering so deeply. There would be something amiss if we didn't. That has to help you feel better. What is more, we are not inherently unlovable. There is nothing wrong with us per se. Our characters are not repellent, nor our faces abhorrent. The union collapsed because we were unfit to produce a balanced child with one particular person. There is no need to hate ourselves. One day we will come across someone who can find us wonderful and who will feel exceptionally natural and open with us. We should in time learn to forgive our rejectors. The break-up was not their choice. In every clumsy attempt by one person to inform another that they need more space or time, that they are reluctant to commit or are afraid of intimacy, the rejector is striving to intellectualize an essentially unconscious negative verdict formulated by the will-to-life. Their reason may have had an appreciation of our qualities, their will-to-life did not and told them so in a way that brooked no argument-by draining them of sexual interest in us. If they were seduced away by people less intelligent than we are, we should not condemn them for shallowness. "What if pleasure and displeasure were so tied together that whoever wanted to have as much as possible of one must also have as much as possible of the other...you have the choice: either as little displeasure as possible, painlessness in brief....or as much displeasure as possible as the price for the growth of an abundance of subtle pleasures and joys that have rarely been relished yet? If you decide for the former and desire to diminish and lower the level of human pain, you also have to diminish and lower the level of their capacity for joy." I'm of the opinion that great pleasure goes hand in hand with displeasure. Everything we have we will eventually lose. I'd much rather have high highs and low lows then always be in the middle. Some people like the middle but I think it's important to feel as much as possible. We don't decide to "feel" being sad, we are just sad. We don't think "Ok, now I'm angry". Our emotions don't work like that. "Not everything which makes us feel better is good for us. Not everything which hurts may be bad"